Long Island’s Chloe Stepanek took the top spot in the 200 free heats. Her 1:46.91 is a tick off her seed time, and considering her 1:46.0 anchor leg on the 800 free relay Tuesday, she probably has a better swim in her tonight. 1000 free champ Paige McKenna showed her range, going 1:47.65 for the second spot. That’s a drop of about a tenth for the Nation’s Capital 15-year-old. Fellow 15-year-old Ella Bathurst is third. But a handful of big names and fast seeds lurk behind those three. 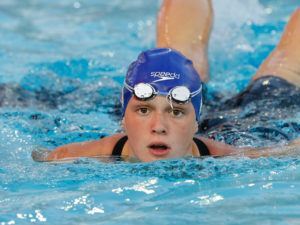 Lexington Dolphin Rachel Klinker has been as fast as 1:46.0, though she was only 1:48.5 this morning. She’s fourth, with 100 free champ Torri Huske (1:48.73) close behind. Huske came in with a 1:47.1 seed and should be in the hunt for the win tonight. Meanwhile 200 fly runner-up Grace Sheble is also in the A final – she was seeded 1:47.0 this morning and went 1:48.84. Wildcat’s Luke Maurer is looking to follow up his 500 free win from last night – he went 1:36.68 to lead the 200 free this morning. That’s a few tenths off his seed time, but Maurer dropped about a half-second in his 500 from prelims to finals yesterday. Bowling Green’s Andrew Matejka is second – he was third in the 500 final last night. Matejka went 1:37.10 a drop of seven tenths from seed. Meanwhile Sean Conway sits third in 1:37.25. That’s two tenths faster than his lifetime-best coming into this meet. Tonight, though, the biggest threat might be 4th-place qualifier Jack Dolan out of Rockwood Swim Club. Dolan has been 1:34.7, but that time was from December of 2017. In the last year, his best time has been a 1:35.5 from NCSAs last year. Even repeating that time would put Dolan in great shape for the win tonight. That 1:34.7 ranks Dolan #6 all-time among 15-16s, but he’s 18 now and only sits 71st in that age group’s history. We’ve got a rematch of last night’s 100 breast final set up in the girls 50 breast. Cecilia Porter is the top seed, going 27.76 this morning. No one else was under 28 in heats. Porter was third last night in the 100. Champion Anna Keating is only fourth this morning, but last night made a big drop from prelims to finals in the 100 breast. Keating went 28.59 this morning. And last night’s runner-up Hannah Bach is second this morning: she was 28.05. In between Bach and Keating is Taylor Steele at 28.34. It’s the same for the boys, with the top three from last night’s 100 breast making the A final. William Myhre is the top qualifier. He was third last night in the 100, but went a quick 24.56 this morning. 100 breast champ Anthony Grimm, who’s been on a tear the last month or so, went 24.60 for a narrow second. Last night’s runner-up Joshua Matheny is fifth at the moment, going 25.37 this morning. No one else was under 25, but the closest was third-placer Paul Kinsella (25.12). 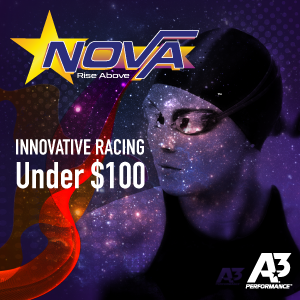 NOVA’s Grace Sheble came off that 200 free to take the top spot in the girls 400 IM. She was 4:08.16, still two seconds off her best time, but a whopping six seconds ahead of the rest of the field here. Sheble ranks 8th all-time in USA Swimming’s 15-16 ranks, and could pass Allie Szekekly and Ella Eastin with a time drop tonight. Isabel Gormley is second at 4:14.08, leading a very tight remainder of the A final. Catherine Purnell sits third (4:14.92) and four more athletes went 4:15s this morning. 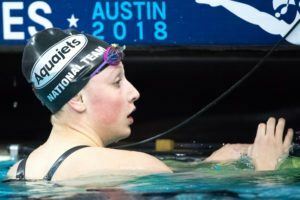 Watch Zoe Dixon in tonight’s B final: the 14-year-old dropped three seconds this morning, going 4:17.21 and moving to #57 all-time in the U.S. 13-14 ranks. She passes up Olympian Elizabeth Beisel with her swim this morning. Long Island’s Jason Louser is the top qualifier in the 400 IM. He was 3:48.70 this morning – a controlled swim, since he’s been as good as 3:45.8 in his career. His top threat is Sean Conway, who also relaxed through prelims with a 3:50.13. Conway has been 3:47.3 before, and both already rank inside the top 100 in 17-18 age group history. Conway is currently 74th and Louser 43rd. NOVA’s Zachary Cram is third, only tenths back of Conway. He cut three seconds from his lifetime-best to go 3:50.37 this morning. It was 100 free champ Torri Huske making her second A final of the morning in 23.72. She went a tenth faster here last year, but could challenge that 23.60 tonight. 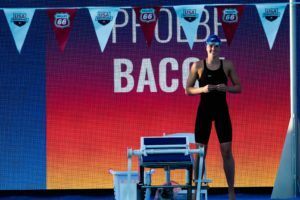 Star backstroker Phoebe Bacon was second in 24.00, followed closely by Athena Ye. Outside of Huske, the whole A final is between 24.0 and 24.4 in what should be a fun field tonight. Anthony Grimm is making a name for himself as a versatile sprinter – he took the top spot in the 50 fly this morning in a blazing 21.01. That’s seven tenths better than anyone in the field. Grimm was the 100 breast champ last night and would’ve won the 100 IM by a large margin, had he not been DQ’d out of that race on day 1. William Rose is second in 21.71 with Aidan Stoffle the other sub-22 behind him. The rest of the field (4th through 8th) was between 22.0 and 22.2 this morning, which should set up a great battle for placement tonight. 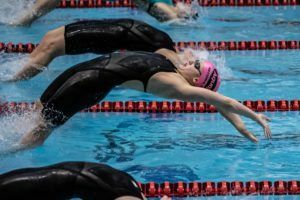 Hard to say because a flat-start 50 fly isn’t a very common event outside of the younger age groups. USA Swimming results show Michael Andrew going 21.3 as a 16-year-old (he went at least 20.60 as an 18-and-under). Didn’t Andrew Seliskar go a similar time a few years ago at the same meet? Seliskar went 20.69 at NCSAs back in 2015 – he was 18 at the time. uhh, is the short name for “Gator Swim Club-NE” still “BGSC”? Because if so, yeesh. BGSC appears to be Bowling Green Swim Club. It is Gator Swim Club out of New England, and not Bowling Green. Joe Bernal is not affiliated with the club anymore. A lot of great kids, coaches and families are associated with the team. Andrew Matejka is headed to Stanford in the Fall. It’s the designation they still use. Not sure why. 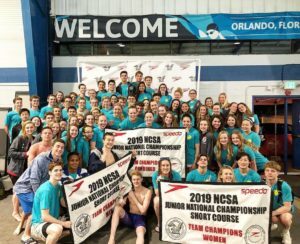 Hi, I swim for Gator Swim Club – NE although Bowling Green Swim Club is also competing here in Florida. Understandably confusing with 2 BGSCs at the same meet. 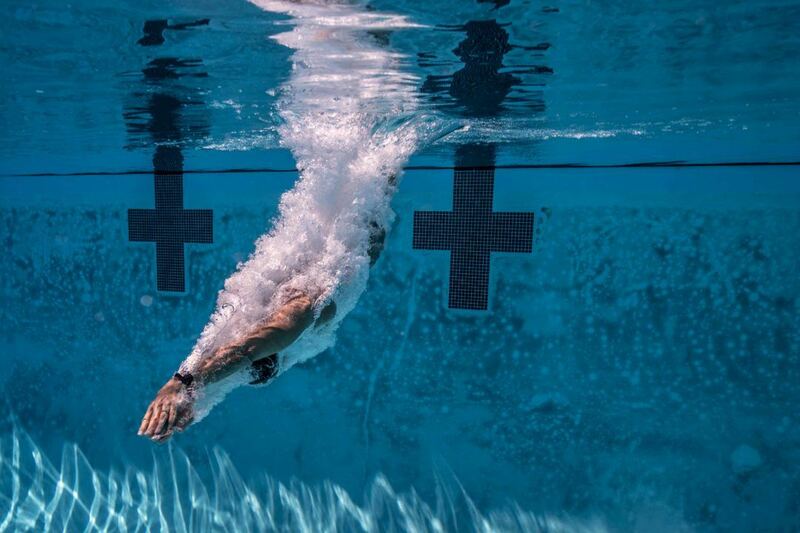 I mean, he goes 20.8 in backstroke — so it would be disappointing if he doesn’t go 20 in fly!